Weighty Matters: Forks, feet, and the rise and fall of obesity. This Thursday should be fun. Firstly it's the 9th anniversary of my marriage to my wonderful wife (who I surely don't deserve). 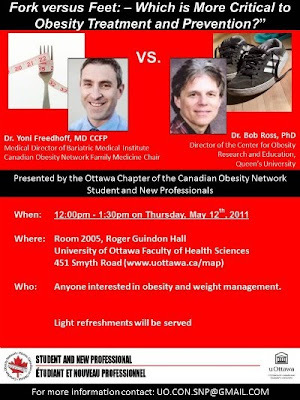 Secondly, courtesy of the Canadian Obesity Network's Student and New Professionals division, I'll also have the honour and pleasure of debating Queen's Dr. Bob Ross on whether or not it's been forks or feet that have led us to where we are with obesity in society, and which deserves more of our attention on our way out. 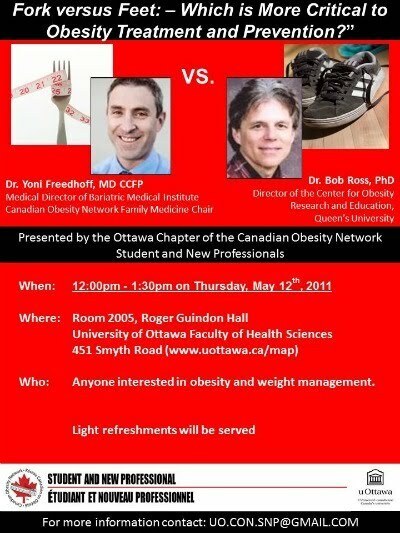 The event's free and will take place from noon until 1:30pm on May 12 in Room 2005 in the Roger Guindon building at the University of Ottawa Health Sciences Complex (the building is sandwiched between the Ottawa General Hospital and the CHEO). For a map of the site, click here. For those who think feet matter more, light refreshments will be served. For those who are concerned about their forks, I have no idea what "light refreshments" means, so it may be wise to arrive well fed and not particularly hungry, lest you be tempted to eat something you might not feel is worth its calories. Through some Internet magic, the CON-SNP folks have managed to organize live streaming audio for those who can't attend using a service called Talk Shoe. The live-stream will begin at 11:55 am on May 12th, and you can logon here, or with the widget down below. I understand the organizers are also trying to figure out a means to stream live video, and if they succeed, I'll be sure to let you know. Readers here will certainly know that my bias falls on forks, but that said, you might be quite surprised by the stance I take on Thursday. With ample time to flesh things out, nuances that may escape the blog are easier to explore. Having heard Bob speak a few times, and being familiar with his work, I have tremendous respect for him, and think that by no means is my positioning here a slam dunk.